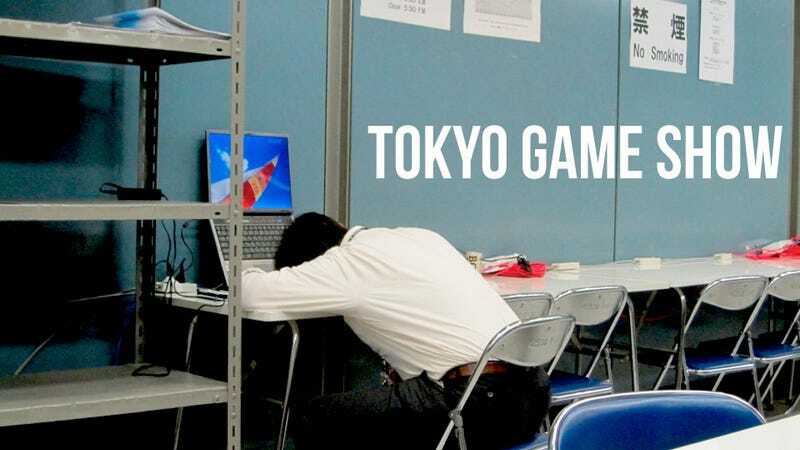 The Tokyo Game Show's first public day brought rainy skies and a flood of gamers. Those who braved the crap weather were greeted with long lines, overwhelming crowds, and cosplayers. Saturday is the day the cosplayers come out to play at the Tokyo Game Show, crowds flocking to the walkways between the show's exhibition halls to see some of the world's best video game costume makers (and wearers) in action. If you thought cosplay at the Tokyo Game Show was all women in tiny outfits, you are dead wrong. There's an army of men out there dressed to the nines as well, and they're impressing the hell out of us..
Cosplay ain't easy. You need an outfit. You need to make up your face and do your hair. But if you think that's serious stuff, check out what it's like to photograph them. At this year's Tokyo Game Show, Microsoft's booth was smaller. Smaller doesn't mean empty. Sony's TGS booth isn't actually that busy, because half of it has been shut down. So the crowds are manageable. At Sega's booth, though, things are getting a little crazy. Konami's TGS booth in 2011 is boring. So boring, in fact, it's not even worth a gallery. But there's someting tucked away inside that is: this fancy Metal Gear and Zone of the Enders swag.